Few known pictures show Upper Wood, above Matlock Bath, possibly because it was such a climb up the hill. Both this image and the twentieth century picture of Upper Wood elsewhere on this site include views of the surrounding countryside. Top left on this image we can see the Victoria Tower with the buildings around the Upper Tower on the Heights of Abraham just below it. Although it is a haze, the Matlock hillside can be seen over the top of High Tor and the hillside behind High Tor, on the right, slopes up to Starkholmes and then Riber. The later picture does not include a view of the Matlock Bath valley below Upper Wood. Because we can see the valley clearly here we know that this picture was taken towards the end of the nineteenth century. What helps with the date is the skating rink in the village, next door (down the hill) to the red bricked rear view of Clarence Terrace. This large building was not sold for development until the early 1890s after which houses were built on the land (Rockvale Villas and Rockvale Terrace). We can also see the cluster of houses around Holme Road - the Clarence, Clarence Villas, Brunswood Road and the former vicarage. The white wiggly road above this group of buildings, but below the Heights, is Masson Road. There were several families living in Upper Wood in 1891, some of whom had been there for a number of years such as the Davis', Raynes', Seedhouses and Widdowsons. Matlock Bath's parish registers also show Allens, Pickerings and Potters living in Upper Wood. The 1848-9 Tithe map tells us that Potters Croft, Boden Stars and South Briery Wood Close were in this part of Upper Wood. 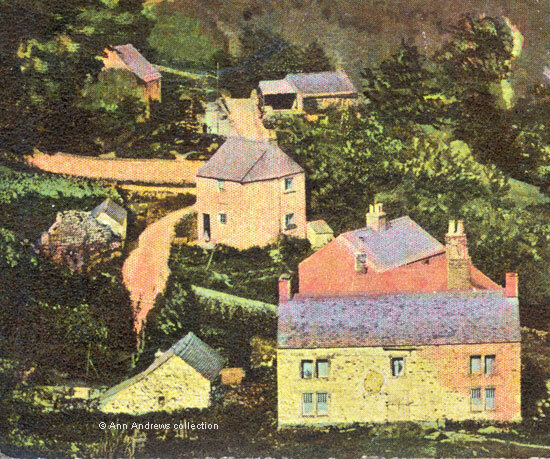 This enlargement of the buildings of the settlement also shows the links to the outside world, with the narrow Upperwood Road going down the hill (centre, near the top), whilst the Wapping path goes past Upperwood Farm and from there, on the right, down towards the southern end of Matlock Bath. Other footpaths connect Upper Wood and Bonsall and a little further down Upperwood Road is what was known as Jacob's Ladder, steps going down past the old Royal Pavilion (Palais Royal from 1923) and finishing close to Temple Walk. It would have been a quicker route to Matlock Bath rather than going down Upperwood Road and Holme Road although the climb back up might have made you rather breathless! 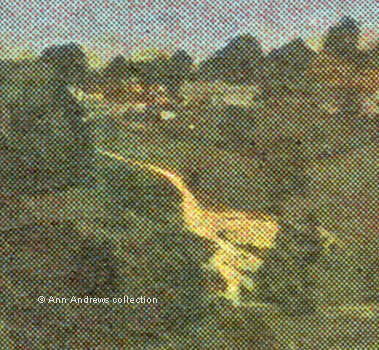 This somewhat grainy enlargement of one section of the postcard shows the remains of the lead mine on the hillside below Starkholmes. On the Ordnance Survey maps of 1880 and 1899 the mounds of the slag heaps can be seen. These alter their shape slightly over time and are less distinct on later maps. 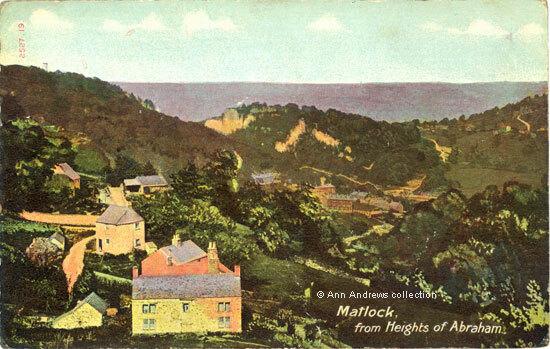 "Matlock, from Heights of Abraham", published by Hartmann, No.2527.19. Printed in England. Not posted. The message was to To Mrs. Richardson, with New Year Greetings. The 1891 census shows Upperwood residents from the time of this picture, beginning with the Widdowsons and finishing with the Mottrams. Also see the 1841 census | the 1851 census. Matlock Bath Parish Register, Derbyshire Record Office, Matlock. Tithe map, Derbyshire Record Office.